For a couple of days now, I have been carefully thinking about the right words to utter and the appropriate acts to carry on after a gang of NetFix LLC writing websites have committed another round of bullying and sabotage to completely destroy my own review website, IHateWritingEssays.com. Why does this gang have to monopolize the writing industry with their inefficient services that compromise the academic standing of hopeless students and the career potentials of their clients? Do they really have to go as far as constantly attacking me and the team behind IHateWritingEssays just so they could continually prey on those who are badly needing writing services? The first time that our review website has been attacked with false and malicious claims was in the latter part of 2017. Universal Research Inc. that owns BestEssays.com and NetFix LLC that owns a couple of other independent essay sites such as UKWritings.com, GrabMyEssay.com, EssayThinker.com, EssayRoo.com, BoomEssays.com, Academized.com, AustralianHelp.com have both created a wicked scheme to destroy my reputation that I have long worked hard for. Indeed, that was a very frustrating time for me because I was initially caught unprepared of the possibility of facing evil schemes coming from internet businesses like them. Despite such a trial, I did what was ethical by making a counter-claim and contacting the proper authorities for that matter. I had been steadfast in proving the falsity of their allegations and the malevolence of their intentions. In the end, I survived the challenge and felt extremely vindicated from their spiteful slander against me. I didn’t expect that just a couple of months after, I would be facing another unnecessary yet troubling inconvenience as the same gang made new deceptive accusations which they have filed to the DMCA. The first copyright allegation is that IHateWritingEssays have taken the website logo of EssayPro.com. You may know more details here: https://www.lumendatabase.org/notices/17328962. 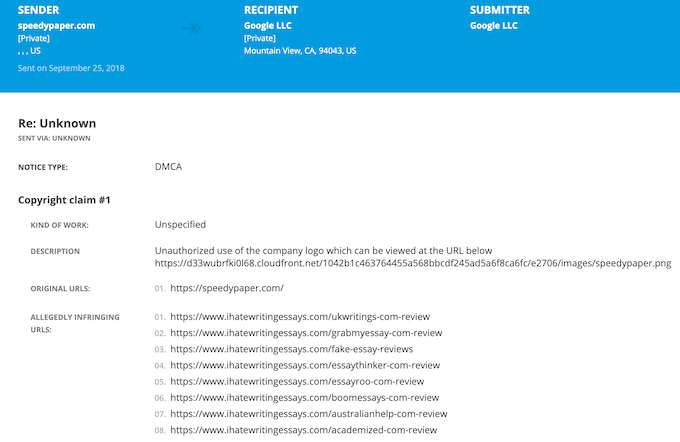 The second DMCA complaint that was filed was also concerning the same issue of logo use but this time on behalf of SpeedyPaper. Get more details here: https://www.lumendatabase.org/notices/17328968. 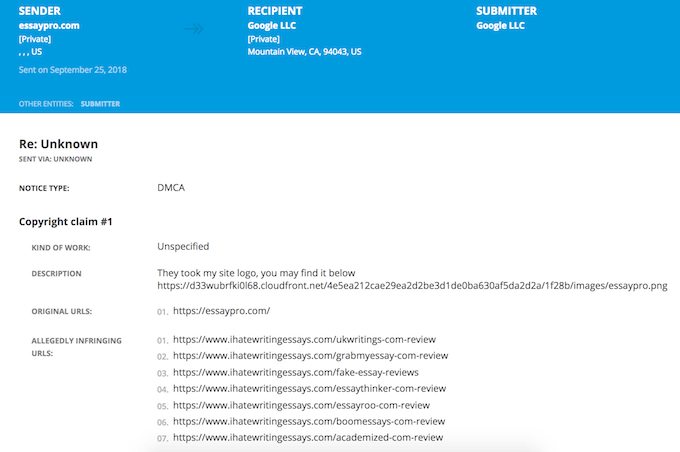 If you will notice, all the complaints filed to the DMCA against IHateWritingEssays.com were done by unknown senders. How could anyone trust a complainant who does not even have a personal name? How does the DMCA or Google LLC even validate the truthfulness of their allegations? Shouldn’t complainants only be coming from the internal organization of the website that they represent? As it turns out, anyone can just ask the removal of a certain website’s page for as long as they’d like to. Such randomness is definitely unfair to those who are upholding righteous principles as they conduct business. If you were in my position, how would you feel if your site had suddenly been removed from Google search results simply because an anonymous person with unknown intentions have created a malicious copyright claim against you? In order to address the current situation, I already sent a letter to Google, Inc. with truthful responses regarding the allegations put forward by the complainants. In my letter, I argued that the logos in contention are under fair use. They were used merely for informational purposes. Furthermore, I asserted the possibility of a competitor just trying to bring me and my team down by taking advantage of the DMCA features. I have declared that EssayPro and SpeedyPaper, the websites mentioned in the copyright claims have officially sent a denial of their involvement in the complaint. Actually, they did not even make an appeal on their review pages which they would have done if they deemed it unfair or illegal. If it was not an authorized representative who filed the DMCA complaint, then who else could it be? Apart from that, they are also trying to put down an honest review that we have made about the presence of fake reviews on the internet that try to lure prospective customers into their low-quality writing services. Seems like they are also trying to manipulate the public perception about their business, right? I found out that these supposedly independent writing websites are all owned by Ukrainian scam company NetFix LLC. Now we see a pattern. Again, EssayPro and SpeedyPaper are independent companies and officially confirmed they have nothing to do with these DMCA takedowns. The internet technology has been used in both helpful and harmful ways. It is so sad how some businesses would resort to unethical practices by destroying the reputation of those who are working honestly and trying to contribute to the society. They use the internet in order to pursue their own selfish interests without being conscientious about the harm it could bring to other people. We all have the responsibility to protect ourselves from those who are trying to monopolize certain industries on the internet by providing false information. IHateWritingEssays will continue fighting for our right to provide truthful content that are of fair and honest standards.